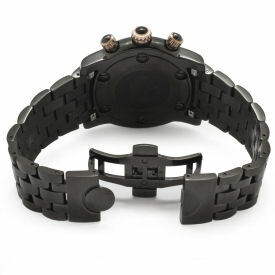 Born in 2005 from a genius Italian creativity and an international soul, Glam Rock watches offer a core collection ranging from $995 to $5,500, with signature pieces from $8,000 to $15,000, positioning itself in the fashion-luxury market segment. All timepieces combine sophisticated aesthetic solutions with high quality finishes, while components and materials are selected by choosing the best experts in each field. Fine leathers, like alligator and python, are handcrafted in France. Movements are strictly Swiss-made. Glam Rock addresses a demanding clientele who has no geographic and cultural boundaries. They are devoted to qualitative choices and care for details as well as for fashion trends, definitively avoiding the "déjà vu". 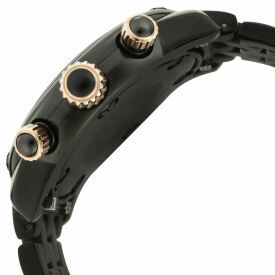 The brand incorporates the values of a chic and dynamic lifestyle, expressed through always evolving watch collections and now through its first jewellery line, Very Glam Rock, launched at Baselworld 2010. With its sophisticated appeal, Glam Rock is today receiving great assents around the world, with key markets in the United States, Asia, and the Middle East. Fun and stylish, this Miami timepiece from Glam Rock is a great addition to anyone's collection. 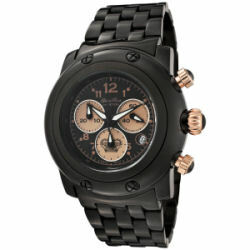 A black stainless steel bracelet and large black case sport a black and rose-tone chronograph dial that anyone can rock. Shipping and handling is $15.00 with in the 48 contintental U.S. An additional $20.00 will apply for Hawaii, Alaska, Puerto Rico, and Canada. We cannot accomindate deliveries internationally.